Our department at work decided to dress up as the Peanuts Gang for Halloween. 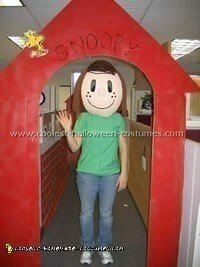 We were inspired by Kimberly B. of Tampa FL, who submitted the Charlie Brown costume, also Lucy and Snoopy to this web site. Each one of us picked a character and made our own mask for that character. We each used one of those punching balloons and coated them with a three to four layers of paper Mache (one part flour and two parts water). For the nose and ears we took Styrofoam balls and sliced in half. For the eyes we cut out the holes and hot glued about four layers of black netting material inside the head. The netting worked great – you can see out but no-one could see in. Linus and Pigpen hot glued pipe cleaners to their heads for hair. Peppermint Patty used a combination of yarn and pipe cleaners for her hair. Sally and Lucy hot glued pillow stuffing to their heads and then spray painted. Schroeder used caulking that expands and it actually came out that yellow color. 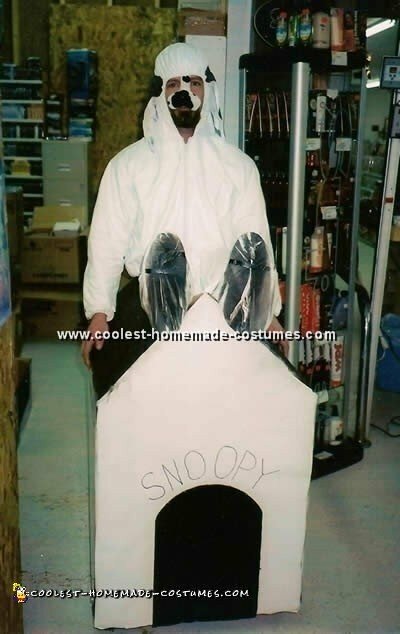 For Snoopy I took a liter soda bottle and cut the bottom into flaps positioned it onto the round paper Mache head and paper Mache it to the head. I built up around the bottle with newspaper to make the snout bigger and paper Mache over that to make it smoother. Then, I covered the whole head with a white fleece material and hot glued the ends of this material to the inside of the mask. I spray painted a Styrofoam ball with black paint and pushed it onto the soda bottle spout. The ears and eyebrows are black felt hot glued to the head. 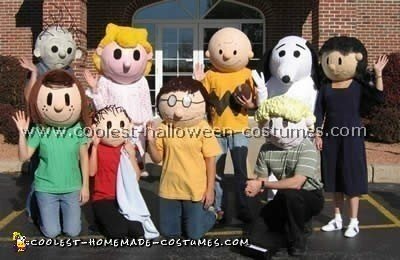 We actually followed a description of a Charlie Brown costume already on this site! We used large balloons (the punching balloons worked really well) and paper-Mache (one part water, one part flour and a little Elmer’s glue for strength and to keep pests away – as instructed by an elementary school art teacher). There were three layers or paper Mache per head over the course of a week and a half. Let each layer dry fully before adding the next. Then we looked at the snoopy.com website to see how each character’s face looks and cut small holes for eyes and used marker for the noses and mouths. Lucy’s hair is black felt glued on and wrapped around empty toilet paper rolls to make the curls at her bangs and the end of her hair. Charlie’s hair is a black pipe cleaner for his bangs and little cow-lick. Peppermint Patty’s hair is brown yarn glued on. Linus (my favorite) is black pipe cleaners which I stuck through tiny holes punched into his head and curved up over his head. Our little blonde boy has a very round head and my husband used to call him Charlie Brown. 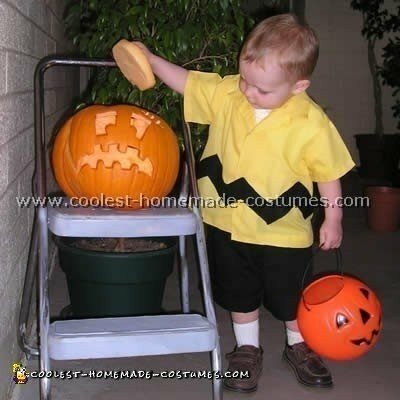 Perfect idea for Halloween to make him a Charlie Brown costume! I sewed a shirt out of $1/yard yellow fabric according to a child’s shirt pattern I have used many times. I also made the black shorts out of scrap fabric but I left the elastic out of the waistband casing. Instead I threaded a metal hanger bent into a circle inside the casing. I cut the black zig-zag from felt and whip stitched it onto the shirt. I also whip stitched the shirt to the shorts sewing it around the hanger. 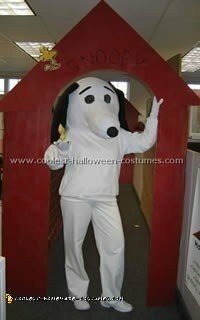 This made it a jumpsuit and the hanger held the costume out in more of a Charlie Brown body shape. It would have been even better if it were even more exaggerated. The shirt closed with velcro. I wish we’d had black dress shoes instead of brown but it didn’t make that big of a difference. 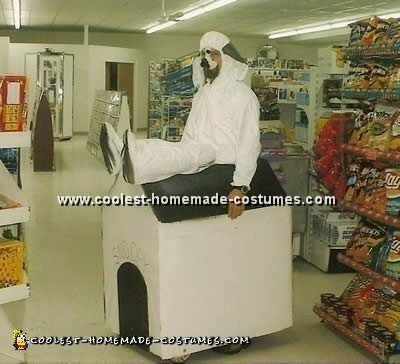 This could have been a much easier costume to make. An oversized yellow tee shirt with some black felt or fabric paint and some black shorts would do the trick too! 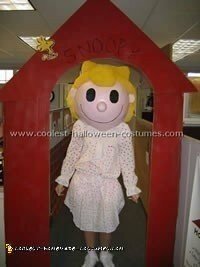 The only problem we had with the Charlie Brown costume was character recognition. Charlie Brown isn’t as popular these days so many people said “What a cute little bumble bee!” My son was quite offended! 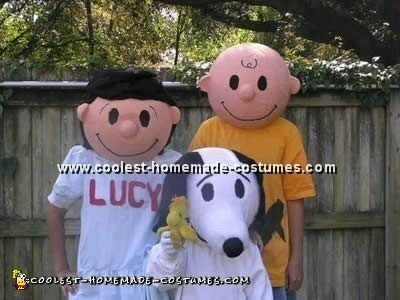 Three of my children wanted a Charlie Brown costume so I dressed them up as Charlie Brown Lucy and Snoopy. I made all three of the costumes by hand. 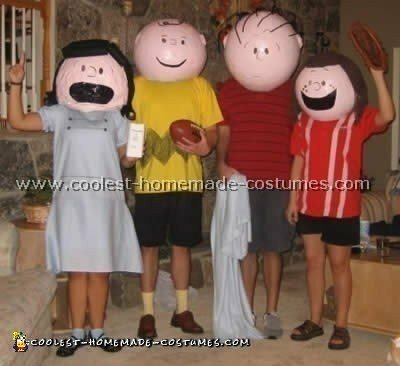 The oversized heads are paper Mache. It took about 5 days to make each one of these. The Paper Mache takes a while to dry. I cut out holes for the eyes to see out of and covered the eye holes with a sheer black material so that the person wearing the head could see out but no one could see in! Snoopy is covered with soft fuzzy material and Lucy has felt hair. I went to a thrift store for the clothes and painted a zigzag stripe for Charlie Browns shirt. My kids love the Halloween classic cartoon “It’s the Great Pumpkin Charlie Brown” so this Charlie Brown costume was a perfect tie-in! After putting this build off for a number of years I finally made this Charlie brown costume. Very simple and cheap! First off I found a large enough box. After cutting it into shape I glued the flaps to the peaks. Don’t be shy with the glue. I cut a hole for me to stand in. Being so bulky a scored a couple of wheels off and old lawn mower and using a wooden dowel between them I screwed them to the front right through the cardboard. Instead of painting the brown box I used the backside of old posters from a local grocery store. The roof and doorway were then spray painted black. For Snoopy I used two pair of paper disposable coveralls, one for me and one for the legs. 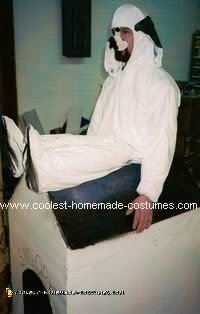 I used winter boot liners for the foot shape and the stapled the legs to the roof. For an added touch I bought the nose piece at the local bargain store. 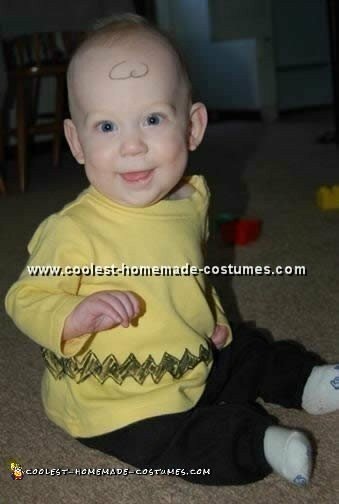 Although bulky, good Charlie brown costume but not to be used near any stairs.